Passed on March 9 evening, those who participated in the meeting included sarpanches or village heads Shaktisinh Gohil (Jasapara), Samuben Dabhi (Mithivirdi), Vilasba Gohil (Mandva), Pruthvirajsinh Gohil (Khadarpar), Dayalbhai Jambucha (Paniyali) and the members of these gram panchayats. The resolution to declare the region Nuclear Free Zone was passed “unanimously”, PSS said, adding, “A copy of the resolution will be sent to President of India Pranab Mukherjee, Prime Minister Manmohan Singh, Gujarat chief minister Narendra Modi, and secretary-general, United Nations, Ban Ki-moon. 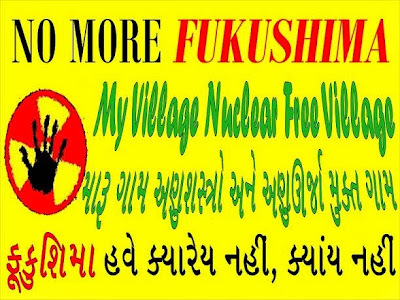 Proposed to be developed by the Nuclear Power Corporation of India Ltd (NCPIL), a Government of India undertaking, the resolution suggests “people’s desire to keep the neighbourhood nuclear power free”, the environment body in its statement signed by Rohit Prajapati and Trupti Shah said. The resolution is significant, in view of the fact that the environmental public hearing of the proposed nuclear plant ran into controversy, as it was held on the basis of an environmental impact assessment study, an unaccredited agency, inviting strong protests from the locals (click HERE to read details). The production of nuclear weapons or of nuclear power shall not be allowed in the city/ village/ municipality. No facility, equipment, components, supplies or substance used for the production of nuclear weapons or nuclear power shall be allowed in the city/ village/ municipality. No person, corporation, university, laboratory, institution or other entity in the city/village/municipality knowingly and intentionally engaged in the production of nuclear weapons or with respect to nuclear electricity generation shall commence any such work within the city/ village/ municipality after adoption of this chapter. Nothing in this chapter shall be construed to prohibit or regulate the research and application of nuclear medicine or the use of fissionable materials for smoke detectors, light-emitting watches and clocks and other applications where the purpose is unrelated to the production of nuclear weapons or nuclear power. Nothing in this chapter shall be interpreted to infringe upon the rights guaranteed by the Indian Constitution. So you support nuclear medicine but oppose nuclear energy? More people have been killed by nuclear medicine, just look up the history of accidents (granted it has saved even more lives, but you are choosing to look only at the risks). Also consider that without nuclear power India will be in the dark and is running out of coal and oil.